Alena Melnikava graduated from the Institute of Journalism of the Belarusian State University. Moreover, she took courses in digital journalism at the Stockholm School of Economics in Riga and the Press Club Belarus. She has already worked as a journalist for the independent magazine „Bolshoi“ and website CityDog.by. Currently, she is the department editor at TUT.BY, the biggest news website in Belarus. 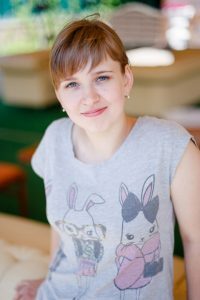 In her articles Alena mainly focuses on social, political and cultural issues.